472 pages | 254 B/W Illus. 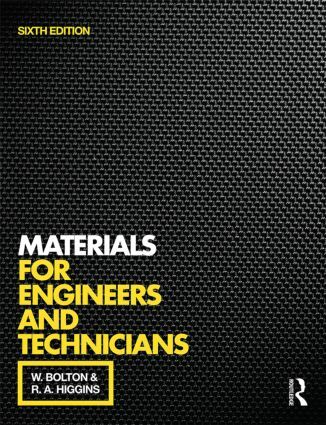 A comprehensive yet accessible introduction to materials engineering which provides a straightforward, readable approach to the subject. The sixth edition includes a new chapter on the selection of materials, an updated discussion of new materials, and a complete glossary of key terms used in materials engineering. This renowned text has provided many thousands of students with an easily accessible introduction to the wide ranging subject area of materials engineering and manufacturing processes for over forty years. It avoids the excessive jargon and mathematical complexity so often found in textbooks for this subject, retaining the practical down-to-earth approach for which the book is noted. The increased emphasis on the selection of materials reflects the increased emphasis on this aspect of materials engineering now seen within current vocational and university courses. In addition to meeting the requirements of vocational and undergraduate engineering syllabuses, this text will also provide a valuable desktop reference for professional engineers working in product design who require a quick source of information on materials and manufacturing processes. Engineering materials; Properties of materials; Mechanical testing; The crystal structure of metals; Casting process; Mechanical deformation of metals; The mechanical shaping of metals; Alloys; Equilibrium diagrams; Practical microscopy; Iron and steel; The heat-treatment of plain-carbon steels; Alloy steels; The surface hardening of steels; Cast iron; Copper and its alloys; Aluminium and its alloys; Other non-ferrous metals and their alloys; Plastics materials and rubbers; Properties of plastics; Ceramics; Glasses; Composite materials; Fibre-reinforced composite materials; Methods of joining materials; Causes of failure; Choice of materials and processes; Selection of materials Appendix A: Properties of engineering materials; Appendix B: Glossary of key terms; Index. R.A. Higgins was a Senior Lecturer in Materials Science at the College of Commerce and Technology, West Bromwich, UK. He was a Chief Metallurgist at Messrs Aston Chain and Hook Ltd., Birmingham, UK, as well as an Examiner in Metallurgy for the Institution of Production Engineers, the City and Guilds of London Institute, the Union of Lancashire and Cheshire Institutes and the Union of Educational Institutes.